Delayed twice on account of the tsunami and Nepal crisis, the SAARC Summit opened today, favouring a united fight against terrorism afflicting the region with Prime Minister Manmohan Singh making it clear that there should be “zero tolerance” towards the menace. 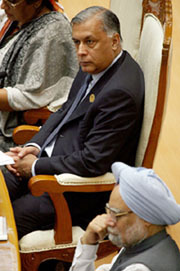 Prime Minister Manmohan Singh and Pakistan Prime Minister Shaukat Aziz at the inaugural session of the South Asian Association for Regional Cooperation (SAARC) summit in Dhaka on Saturday. Will Abu Salem’s extradition strengthen India’s case against Dawood Ibrahim? Monica Bedi, Abu Salem’s companion, was today remanded to judicial custody till November 25 by a CBI special court judge here. The lohar tola of this vast village on the banks of river Tons, has visitors from afar. Twenty five kilometres from district headquarters in Azamgarh, this is no tourist spot. Its famed blacksmith reportedly made the single-use handgun which killed music baron Gulshan Kumar. A doodhwala (milkman) of Batala was the brain behind the sensational daylight robbery in Uco Bank here. 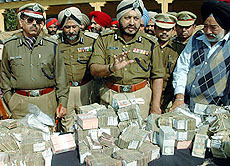 The police today said they had arrested four members of a dreaded gang of robbers from the sleepy township of Batala and the gang was responsible for 11 bank robberies since the year 2001. 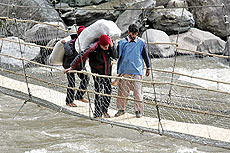 Shaking hands firmly on a bailey bridge, that fleetingly become a bone of contention between the two countries, Indian and Pakistani army officials today opened the third border meeting point along the LoC to ferry relief material across till “all the quake-hit are rehabilitated”.